Sometimes transition feels like a long dark hallway. 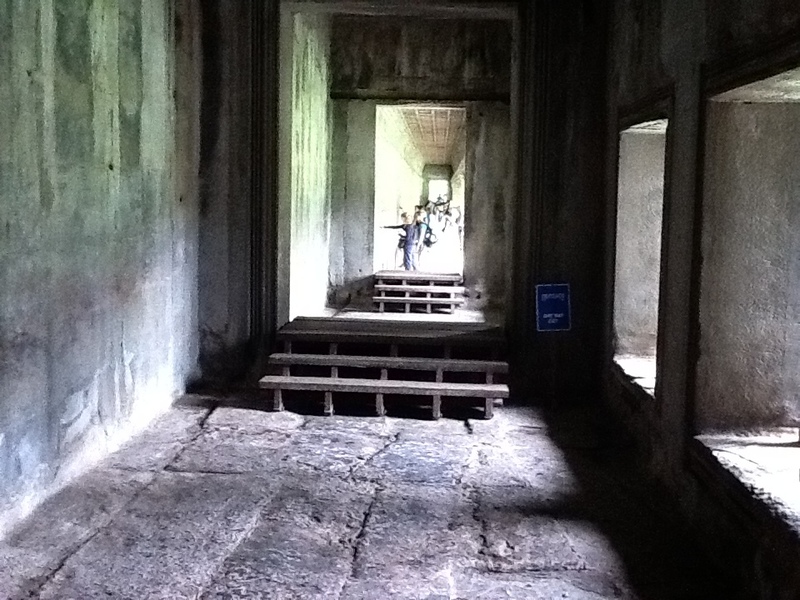 This picture was taken at Angkor Watt in Cambodia, the year that a major transition in my life began. It reminds me how transition feels sometimes. Transition is nothing more than a change in position. Moving us from point A to point B without us really knowing what is happening. At times we are fully aware and at others we couldn’t be more in the dark. I have learned as I have matured that when God begins to make you aware of a change that’s coming, it’s rarely immediate. More than likely you are about to begin a walk down that long hallway. The next few blogs I am going to write the lessons my family and I have learned through this two year transition. All I can say is walking from one end of that hall to the other was one of the hardest, yet most rewarding things we have ever done. At times it was clear and easy to navigate at others it was dark, difficult and frustrating. But, all things work together for good and we have traveled the length of that hallway with success. One thing I will mention before ending this blog is that as we always hear, the journey is as important as the destination. Transition is a teacher, and if we avail ourselves of the opportunity to learn we will not only reach our destination but we will reach it, better than we were when we started the journey. So, if you are in that hallway right now, look around, think about the process, learn, learn, learn. Don’t be discouraged and don’t give up, at some point God will turn the light on for you. How to Get and keep Friends. How to Lose a Friend. How do we keep the first, first? Principle 1: Plan our priorities not our time. Everyone has the same amount of time. When you hear someone saying I don’t have time, or I ran out of time, its not because they have less time than others, its because they are not using it as well. Plan, period, most people fail to even plan, but when you plan, develop your plan on what is important, not based on time availability. If you don’t have enough time to do it all, then don’t do something that is not a priority. This sounds simple, but if we would do things Gods way, things in our lives work better. God’s priorities should be our priorities. your relationship with your family and friends are more important than stuff or hobbies. example: Pray for blessing, God blesses you, you get stuff, then you replace God with the stuff. OR, You get the stuff to “spend time with your family, or use it for your family” but then you have to work all the time to pay for the stuff you got, to spend time with your family. Nothing wrong with stuff in its proper place and perspective, always, God and people over things. Principle 4: Take God off of Your Priority List. (by surrendering your time, Talent, and treasure to Him) Jesus at the Center of our lives. 1. Time….Don’t give God a slot of time in your day, give your day to God. 2. Talent….Put Jesus at the center of your gifts and talents and let Him call the shots. He promotes, He enlarges, he gives opportunity. Making your gift about you is an insult to God and will never bare the fruit it could as long as your in control of it. 3. Treasure….Surrendering our treasure to God. 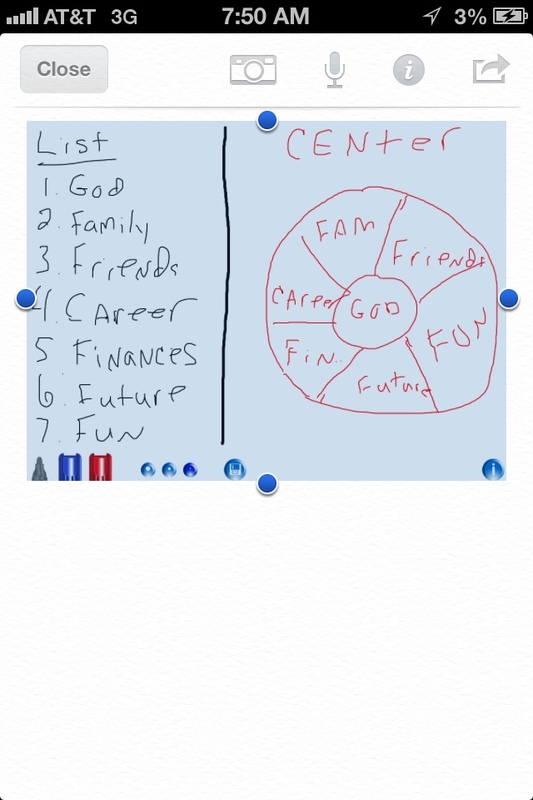 Everything that has to do with our finances, place God at the center. Last thought: God is much too big to be on our menial, earthly, insignificant list of priorities. He is not a priority, He is a person, with whom we have a relationship. He is our God and placing him on some kind of list is an insult to Him. To keep perspective and avoid distraction in our lives we must surrender our whole lives to Him, by placing Him at the center, so He influences, Guides, and directs every intricate part of our lives. 1. Our life is not lived to the fullest as long as we are putting last things first. a. Last things consist of letting life act on us instead of us acting on life. b. Last things consist of choosing our wants over our responsibilities. Many people are held hostage by an inability to set priorities, allowing the unimportant to trump the important. c. Last things are self centered. Many people are held hostage by selfish ambition. 2. Our life is not lived to the fullest as long as we are putting first things last. 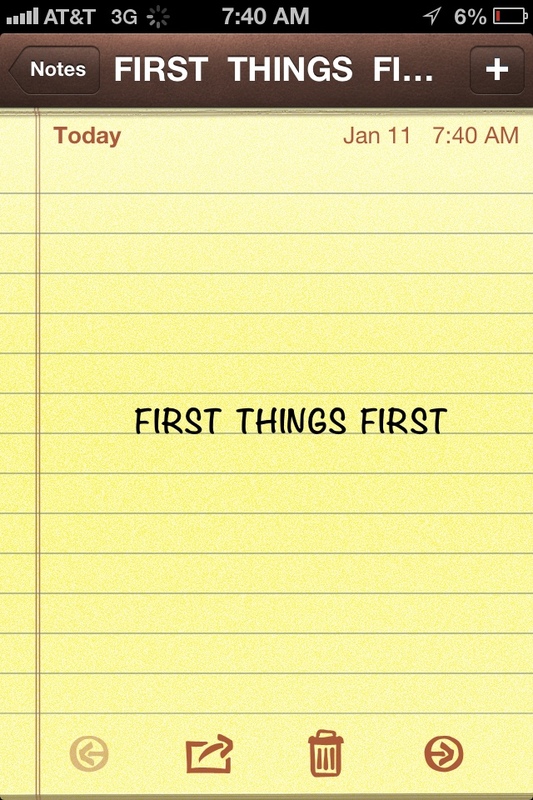 Note: If we put first things last, then last things will automatically move to the front of the line. When we do not choose to make priorities, to put first things in their proper place and last things in their proper place, or just to put areas of life in the place they belong, then urgency takes over and our lives become consistantly reactionary. a. First things consist of those things that first and foremost have eternal consequence. our Relationship with God, His purpose for our lives, and our place in His church. b. First things consist of those things that we have stewardship over. c. First things consist of those things which may not always seem immediate, but if neglected in the long run will be negatively effected if not put in first place. Our relationships, our finances, our career. 3. Our life IS lived to the fullest only when we learn to put first things first. Remember we are not making a priority list here we are centering our life on Jesus. Our relationship with God is central to our lives and affects every area of our lives. If we keep Him first all other areas will naturally fall in line. Matthew 6:33 (contemporary English version) 33But more than anything else, put God’s work first and do what he wants. Then the other things will be yours as well.